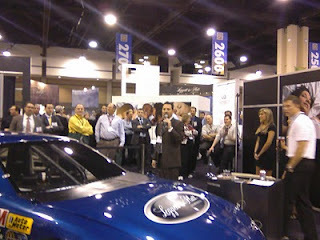 Mark Quinn is currently announcing winners of our Racing Experience contest. The top qualifers over two days of competition are gathered for a final race-off. The race car simulator has been a tremendous hit in the booth during ISPA EXPO. The fun will continue at the Fan Appreciation Night party tonight at the North Carolina Music Factory. More racing arcade games will be included with great food, drinks and music. It's official: Tim Westrate is the day's top driver. Tim will receive his prize, an authentic racing experience at a top stock car race track, at tonight's party! Congratulations to all our contestants, and congratulations to all our customers who choose GSG mattress machinery.